A year ago today, Russian entered the Syrian civil war. Allied with forces loyal to Syria’s president Bashir al-Assad, Russian said it was entering to stop terrorism and extremism. While Russian warplanes have hit some Islamic State targets, much of their fury has been aimed at various rebel groups inside Syria, helping to tilt the battlefield in favor of Assad. 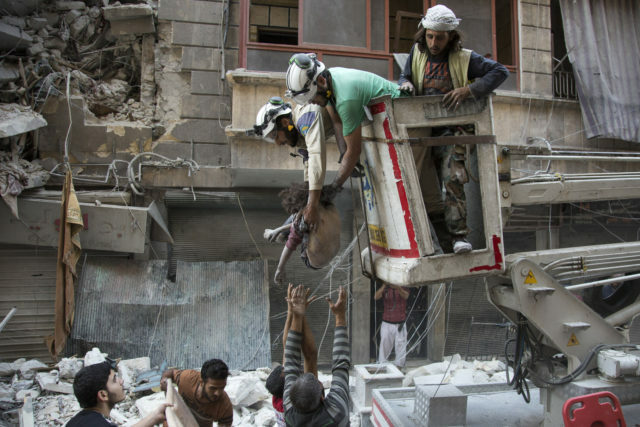 The Syrian Observatory for Human Rights says it can document 9,364 deaths by Russian warplanes in the past year. 3,804 — 40 percent — were civilians, including more than 900 who were under 18-years old. President Obama, along with German Chancellor Angela Merkel, described the Russian and Syrian assault of the ancient city of Aleppo as “barbarous.” The indefatigable Secretary of State John Kerry says he’s “on the verge” of suspending efforts to negotiate yet another ceasefire. Russian Foreign Minister Sergei Lavrov blames the United States for failing to separate the jihadist and extremist groups from more moderate rebels. 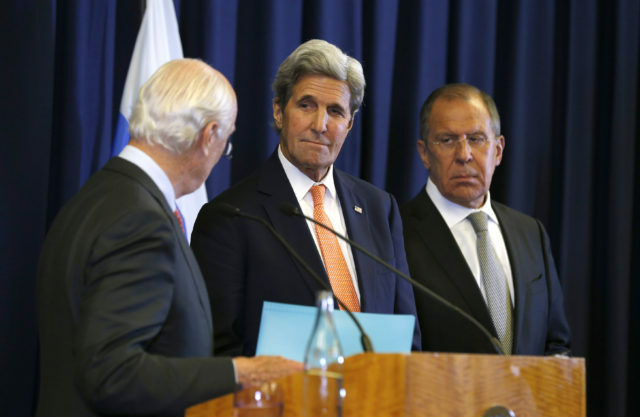 Kerry talks of “pursu(ing) other alternatives” as the airstrikes continue. What might those alternatives be for the United States? And what’s the endgame for Russia, if there is one? The strategy, more about politics than advancing the battle lines, appears to be designed to pressure rebels to ally themselves with extremists, eroding the rebels’ legitimacy; give Russia veto power over any high-level diplomacy; and exhaust Syrian civilians who might otherwise support the opposition. The United States has tried to counteract this by persuading rebels to reject jihadists, in part by promising support for the opposition and by targeting jihadist militants. But the American approach has drawn the Syrian factions closer together, because rebels like those in Aleppo need urgent support on the ground and only extremist groups are available to provide it. 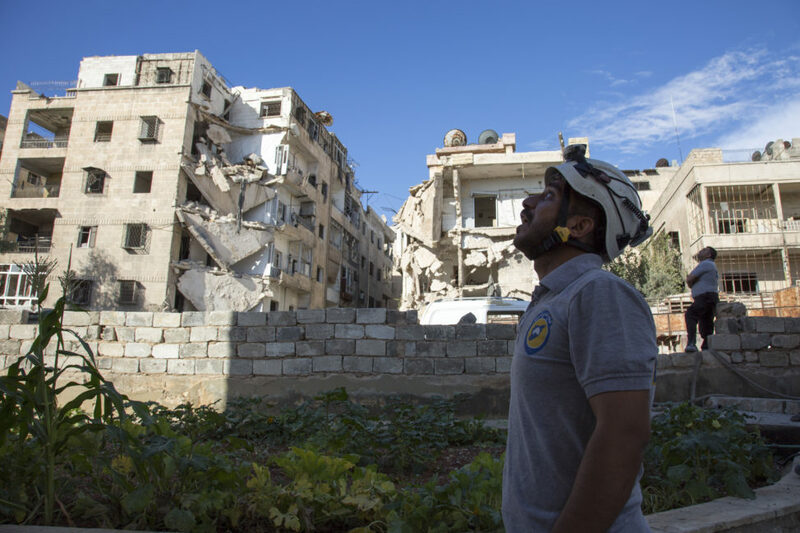 Russia and Assad cannot win, even with a massive bombing campaign. After five years of war and the loss of more than 100,000 soldiers and militia fighters, the regime simply does not have the manpower to take and hold territory in all of Syria. Even after all the killing and displacement, Syria remains a majority Sunni country, and many of them will continue to fight against the regime — backed and armed by Saudis, Turks, Qataris. As Putin helps flatten Aleppo, he may be thinking about Chechnya, the Russian republic he repressed with equally brutal force in 1999. But he may be better off thinking about the Russian experience in Afghanistan. Putin’s widespread massacres of civilians in Syria could very well result in terrorist attacks against Russia by Muslims outraged by Russia’s actions. Obama Is Now Considering Tougher Options in Syria. Hahaha. Right. A limited airstrike on a Syrian military base is also reportedly under discussion but considered unlikely due to the possibility of Russian casualties. Another possibility is providing more aid to anti-Assad rebels, or allowing rebel-supporting countries in the gulf to do so, though officials say this would not include providing them with shoulder-fired anti-aircraft missiles, which is what they really need. Yes, the U.S. fears that these weapons could end up in the hands of ISIS or other terrorist groups, but without them, it’s hard to see how rebels could fight back effectively against regime and Russian airpower. More aid to the rebels without these weapons at this point seems likely to simply prolong the conflict. Mistakes by the Obama administration in its handling of Syria have helped get us into the current situation, but right now I’m not hearing a lot of good ideas from anyone for getting out of it. A careful consideration of military options is not pleasant work for any American president. Yet in this case it must be done. Yes, the Russian presence in Syria—about to mark its first anniversary—complicates things. No, no one is calling for invasion, occupation, or violent regime change. Unless, however, the Assad regime free ride for mass murder is brought to a screeching halt—and soon—there may be hell to pay, and not just by Syrians. The Vladimir Putins of the world may not always draw the correct conclusions from their perceptions of weakness, but they inevitably draw conclusions that can create danger—and not just in Syria. President Obama should avoid misleading Mr. Putin.